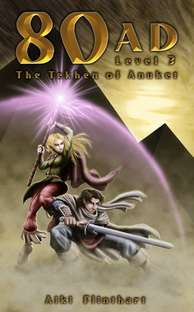 80AD Book 3 finds Phoenix, Jade, Marcus and Brynn trapped inside a pyramid in ancient Egypt. No pharoahs here, this is Egypt as you've never see it. Rome has taken over and the country is far from peaceful. This adventure is the most insane yet. It has everything you'd expect and more: mummies, secret passages, treasure, an evil high priest, human sacrifice, walking undead and more. Together they must escape the clutches of the high priest of the Egyptian god, Set and release the imprisoned goddess of the Nile, Anuket. Without Anuket, Egypt suffers endless drought and the country will die. An ancient prophecy predicts 'the Phoenix' to be the savior of Egypt, but our Phoenix doesn't think he's up for it. He's having enough trouble learning to control Blodbal, his new sword. It seems to have a mind of its own.